Chelsea and Manchester United are reportedly monitoring Sevilla full-back Alberto Moreno and planning a January swoop for the 21-year-old. Moreno has been in Sevilla’s first team for only a few months but his impressive performances have seen him make his full Spanish debut and become a prime target for Europe’s top clubs. Moreno is still eligible for the Champions League this season due to Sevilla not qualifying so a transfer in January would give both Chelsea and United extra depth for the knockout stages should they qualify. The two English sides are also conscious of their ageing first choice full-backs, Ashley Cole and Patrice Evra, and are keen to bring in promising talent to plan for the future. Real Madrid are apparently also interested as they seek to replace the out of favour Alvaro Arbeloa and Fabio Coentrao. United boss David Moyes remains keen on Leighton Baines but Moreno could be preferred due to the Everton and England star’s age. Moreno could also be a cheaper option despite there being a £25m buyout clause in Moreno’s contract. With Sevilla qualifying for Europe by finishing 8th last year, the club could be tempted with a lower offer if they are short of form in the league again. 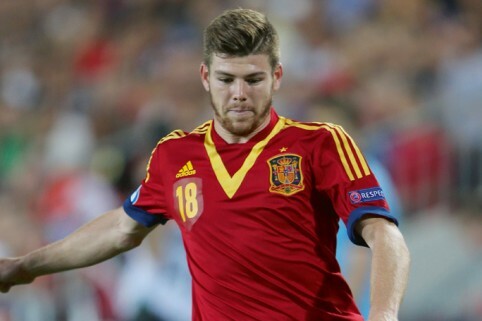 Moreno was a member of the successful squad that won the 2013 UEFA Under 21 European Championships in Israel last year alongside Thiago Alcantara, Isco, Asier Illarramendi, Koke and David De Gea and has won one full Spanish cap since then.